At Bloor-Kipling Animal Clinic, we suggest every pet owner in Etobicoke to have their pets a physical examination to maintain optimal health. Physical exams can help prevent serious health issues in the early stage. It can reduce the suffering of your pet from diseases/illness. Our veterinarians will maintain the yearly health chart of your pet to catch any potential signs of serious illness. For a healthy and growing pet, it is advisable to schedule periodic general check-up of your pets. Apart from pet physical examination, proper vaccination is also very essential. Vaccines are meant to improve the immune system of your pet, making him strong to fight against the diseases. 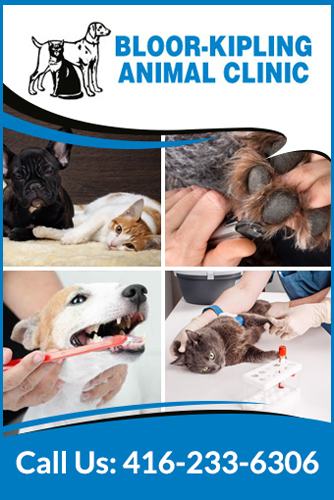 The main concern of our veterinarians is to maintain the optimal health condition of your furry friend. Our veterinarians will determine the health condition of your pet by examining all the essential body parts. We will also check any past medical history you may have. All this information help us improve the quality of your pet’s life. Examine lymph nodes to check for tumors. For proper health and wellness, vaccination is utmost important. They help fight against various dangerous and infectious diseases. Vaccines make the immune system strong ensuring healthy and active life. At Bloor-Kipling Animal Clinic, our veterinarians in Etobicoke will take care of your pet’s overall health care needs. Call us today to schedule an appointment with our vets at Bloor-Kipling Animal Clinic. At Bloor-Kipling Animal Clinic, we are committed to delivering effective and reliable pet health care services in Etobicoke. Our experienced vets always deliver compassionate service to your pets. Call to know more about our services.